A resident in Medellin, Colombia, appears to have captured an object in the sky over a forest. The video was uploaded on YouTube a few days ago but the footage was originally shot on Nov. 16. 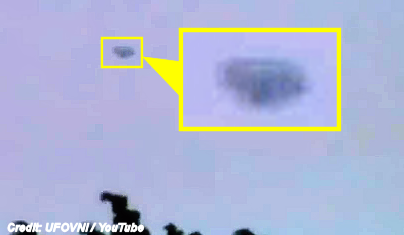 The shaky video goes in an out of focus and shows what looks like a “classic” flying saucer in the sky. However, it’s hard to make out due to the clouds. “The footage shows a saucer-shaped UFO seen in several locations in South America. The UFO is similar to the saucer-shaped UFO filmed in South Wales, UK on November 30, 2014,” says UFO Sightings Hotspot. “It is remarkable that the video of the UFO filmed in South Wales is not longer available and the uploader has closed his account.” . . .